If these beautiful brick walls of the historic Bishop’s House that Al-Amir calls home could speak… Oh, the stories they could tell. The happy chatter of family and friends gathering. The rhythm and flourish of Lebanese music and dance. The laughter of once-in-a-lifetime celebrations. The quiet, loving gazes across a table for two, relishing a fine dining experience together. Since 1988, Al Amir has made these moments possible for guests just like you.We only create our dishes from scratch using the finest of ingredients, carefully spending hours each and every day to create our exquisite cuisine. Come join us as we bring you the delights of Al-Amir! Al-Amir offers flexible and affordable catering for all of your events: intimate dinners, weddings, corporate parties, holiday or group parties, and even large off-site events. Our historic Bishop’s House restaurant can accommodate private parties for up to 100 people. We offer full-service catering, including but not limited to food, beverages, servers, rental supplies, and entertainment. We accommodate your needs from A to Z. Our catering menu features food from our traditional Lebanese cuisine to standard fare of your choosing. Let us know what inspires you and accommodates your budget. We look forward to making your event memorable! 223 SW Harvey Milk St.
Hummus, Baba Ghannooj, Grape Leaves, Tabooli and Falafel. Choose Kabob: Lamb, Beef, Chicken, or Kafta. Charcoal broiled cubes of chicken breast marinated with lemon and garlic. Grilled prawns marinated in olive oil, lemon, garlic, and herbs. Lebanese Salad; lettuce, tomato, cucumber onion and parsley tossed with Al-Amir’s special dressing. Topped with grilled filet of chicken. Hummus plate topped with Lamb, Chicken or Beef shawarma and tahini sauce. Delicate grape leaves filled with seasoned ground beef and Basmati rice that are simmered with lemon, garlic, and herbs. Delicate grape leaves filled with chickpeas, parsley, and Basmati rice that are simmered with lemon, garlic, and herbs. Cucumbers, tomatoes, and parsley. Mixed greens with feta cheese and Al-Amir's garlic dressing. A blend of black tea, mint, anise and cardamom. Served hot or iced. A luscious pastry layered with ricotta and mozzarella cheese, then topped with light orange blossom syrup. Served warm. Seasoned ground beef with parsley, onions, and stuffed in pocket bread. Grilled to a crisp! Grape leaves filled with seasoned ground beef and Basmati rice then simmered with lemon, olive oil, garlic, and herbs. Seasoned mix lamb and beef balls sautéed with peppers, onions, and tomato sauce. Two layers of seasoned ground beef mixed with bulgur wheat then stuffed with ground beef and baked to perfection! Platter of hummus topped with your choice of lamb, beef, or chicken shawarma. French feta cheese and black olives that are served with lettuce, cucumbers, and tomatoes. French cut potatoes deep-fried in vegetable oil. Sautéed cauliflowers, zucchinis, and carrots that are topped with garlic and tahini sauce. Platter of Hummus, Baba Ghannooj, Tabooli, Grape Leaves, and Falafel. Lettuce, cucumbers, tomatoes, and parsley. Mixed with Al-Amir’s garlic dressing and topped with grilled fillet of chicken. Lettuce, cucumbers, tomatoes, and parsley. Mixed with Al-Amir’s garlic dressing. Topped with seasoned grilled shrimp. Grilled cubes of lamb OR beef marinated in Al-Amir’s special blend of spices. Grilled cubes of tender chicken breast marinated in Al-Amir’s magic garlic, oil, and lemon. Grilled prawns marinated in lemon, special blend of herbs, and Al-Amir’s magic garlic. Lamb seasoned in Al-Amir’s special spices and roasted over low fire. Served with cucumber yogurt sauce on the side. Traditional Lebanese grilled kabob with ground lean mix of lamb and beef mixed with parsley, onions, and seasonings. Delicate layers of Phyllo pastry filled with walnuts and pistachio, then moistened with a light syrup and orange blossom. Traditional Lebanese pudding flavored with light syrup and orange blossom. A luscious pastry layered with ricotta and mozzarella cheese, then topped with Lebanese syrup and orange blossom. Served warm. Please ask your server for selections. Call (503) 274–0010 or book online with OpenTable. Al-Amir was chosen as this years Diners' Choice by OpenTable! “You are truly amazing, inspirational, and such a genuine sweet heart. Such a blessing to be around every time we see you. Thank you! I love your great explanations about how to make your recipes. Your flexibility with the ingredients makes me feel like I can’t make a mistake if it’s not exact.
" I have had the pleasure of dining at Al-Amir many times. I consider Al-Amir to be not only one of my most favorite restaurants in Portland, but my second home. Moe and Lydia warmly welcome you into their fabulous restaurant, as if you were walking into their family dining room. The wonderful aromas of exotic spices fill the air. The smooth and silky hummus, the slightly smoky flavor of the baba, the amazing tabouli, fabulous grape leaves, fresh fattoush salad and delicious kibbi are meals in themselves. But, when you order the maza platter, the table is cleared and refilled with the most amazing grilled chicken, shrimp, lamb shanks, kafta arayes, and some of the most flavorful rice with tomato sauce that you’ve ever tasted. My daughter is a vegetarian and loves Al-Amir because their vegetarian options are fantastic. One of her favorites is the batinjan (egg plant). You really need to pace yourself because you just don’t want to stop eating! The food is so amazing. If you can, finish the meal with a flavorful Turkish coffee and Al-Amir’s baklawa dessert. I have also had Al-Amir cater an open house for me, and it was wildly successful. 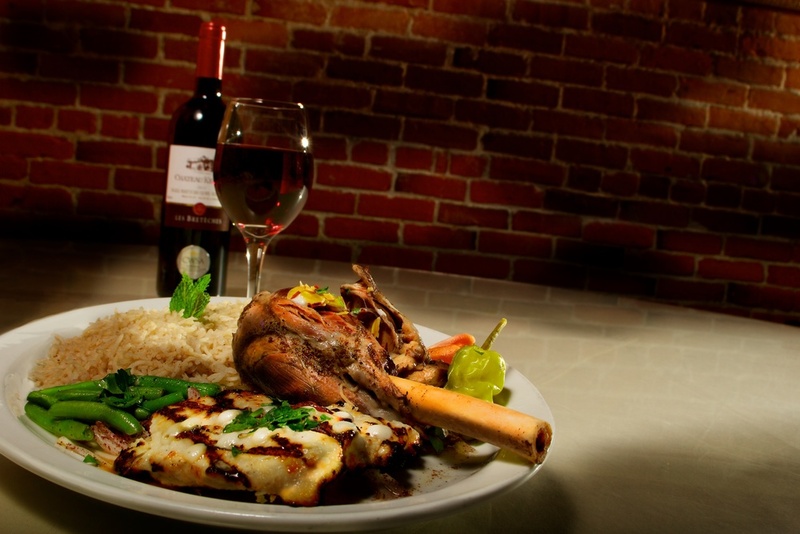 “If you are looking for an amazing Lebanese restaurant, Al-Amir is the place. Feels like a delicious home cooked meal every time. The hummus is the best in town by far, and the atmosphere and wait staff are warm and friendly. I dine here often on my lunch-hour downtown. It’s such a pleasure to be served so quickly and have a relaxing meal during lunchtime. I recently dined here with my family on a Friday night. It was such fun. Great food, amazing cocktails, and a belly dancer all together in one place. An authentic restaurant and a memorable experience each time! “Our decision to have Al-Amir cater our wedding was the best one we could have made! Moe and Lydia are a dynamic duo that handled all the details of our big day gorgeously, and with such ease. From the flowers to the music, the belly dancers, and–of course–the delicious food! All of our guests absolutely loved the experience. Beyond that, we appreciated that Moe and Lydia really make you feel like family.